Our summer tradition: The Public Theater’s Shakespeare in the Park productions. In 2007, we enjoyed Romeo and Juliet and A Midsummer Night’s Dream. This year brings Hamlet and Hair… and a change to the ticket distribution system. 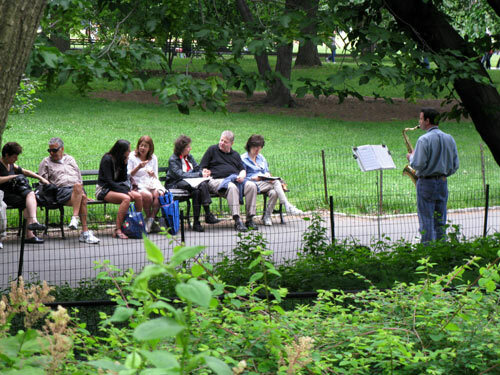 Reserving a seat to these free productions used to involve camping out — sometimes overnight — on the line in front of the Delacorte or Public Theaters for the 1PM ticket distribution, or making a “summer supporter” donation to the Public Theater. This summer, for the first time, the theater also offered guests the option of joining a “virtual line” — actually, more a lottery — by registering at the Public Theater reservations website and submitting requests for up to two tickets on each performance day. Online reservations? That, I can do. 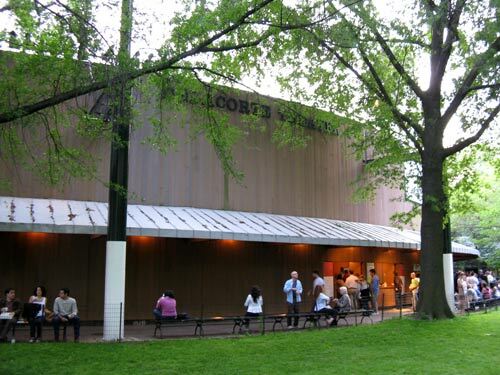 That, in fact, is how we found ourselves at the Delacorte, the first week of the run. 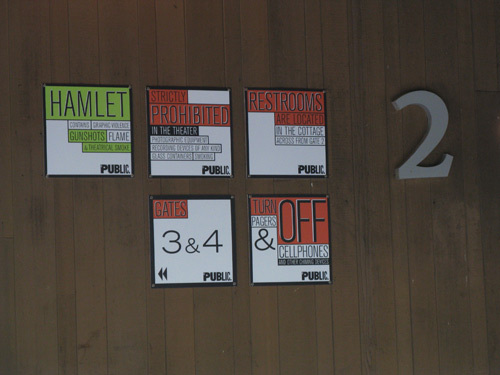 This production marked the SITP’s first Hamlet since 1975, when Sam Waterston held the title role. 33 years later, Waterston settles impressively into an almost sweetly buffoonish Polonius. Somewhat less successful was Michael Stuhlbarg, who received a Drama Desk Award and a Tony nomination for 2005’s The Pillowman, as the melancholy (and sometimes manic) Dane. Rounding out the familiar television faces: Lauren Ambrose (last year’s Juliet) as Ophelia; Emmy winner André Braugher as Claudius; and Margaret Colin (lately of Gossip Girl) as Gertrude. Of note: an unexpected ending, some amusing costuming (especially in the swapped top/bottom suits of Rosencratz and Guildensten) and the wonderfully creative of play-within-a play, which featured dancing lifesized marionettes. Reviews were mixed, but this Hamlet at least fared better than the 2000 production at The Public, with Liev Schreiber in the title role, which received one of the most brutal reviews I’ve ever read in New York magazine. To kick off the summer’s River to River Festival, soprano Leah Partridge and tenor Norman Reinhardt performed an evening of operatic arias and duets in Battery Park City’s South Cove. 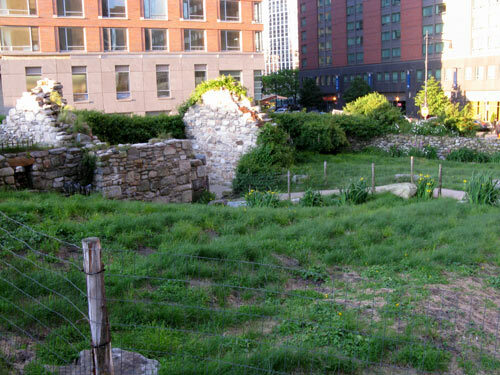 On my way to the outdoor music recital, I walked by the Irish Hunger Memorial — a striking 1/4 acre plot of land nestled anachronistically among the lower Manhattan skyscrapers, jutting out from the sidewalk at Vesey Street and North End Avenue. 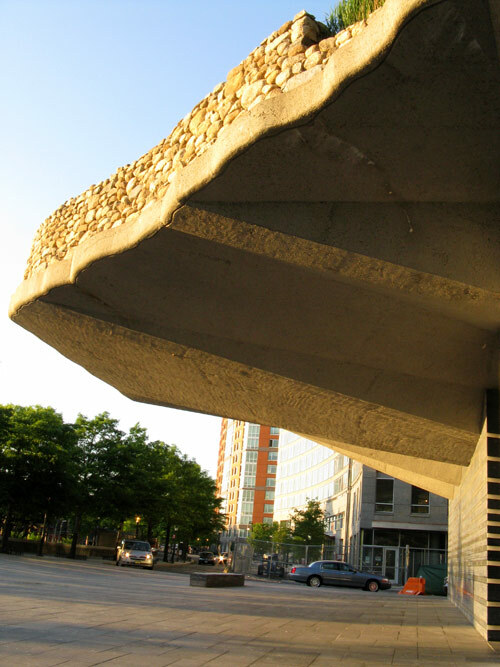 The memorial was designed collaboratively by artist Brian Tolle, in association with 1100 Architect and landscape architect Gail Wittwer-Laird. (Factsheet .pdf) Theirs was the winning entry in a 2000 design competition for the site, which was donated by the Battery Park City Authority. Ground broke on the $4.7 million memorial on March 15, 2001; it was dedicated by Governor George Pataki and Governor and President Mary McAleese of the Republic of Ireland in a ceremony on July 16, 2002 — several months late due to the area’s limited access following September 11. 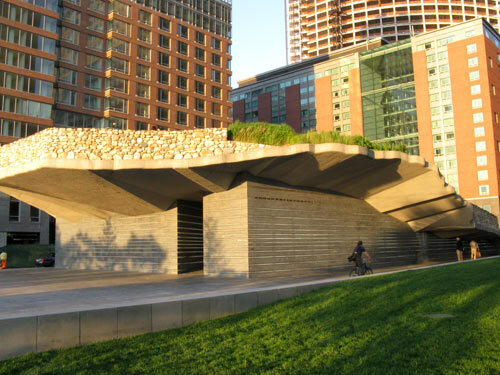 The neighborhood is now so crowded with memorials (World War II, The Museum of Jewish Heritage, Ground Zero) that after the Irish Hunger Memorial dedication, columnist Jimmy Breslin dubbed it “Misery Mile” to contrast with Museum Mile uptown. 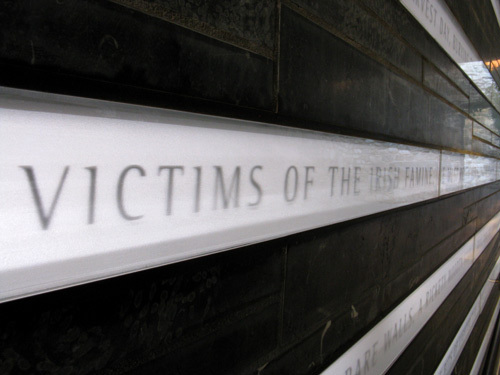 The exterior wall of the memorial and its interior passageway are lined with almost two miles of text, etched onto illuminated glass and Plexiglas panels: excerpts of bills, notes, letters, statements, songs and reports, recipes, quotations, proverbs and statistics, intended to provoke debate or inspire reflection. The memorial’s 1/4-acre lot represents the maximum-sized plot one could own to still be eligible for any form of government relief under the infamous Gregory Clause that was added to the Poor Law of 1847 — a British land policy which effectively cleared estates for landlords and exacerbated the famine by destroying a way of life for an entire class of small farm laborers in Ireland. Thousands died of starvation rather than relinquish what little they still had. Wittwer-Laird’s landscape utilizes stones, soil, and some 62 varieties of grasses and wildflowers from fallow potato fields all brought in from the western coast of Ireland. 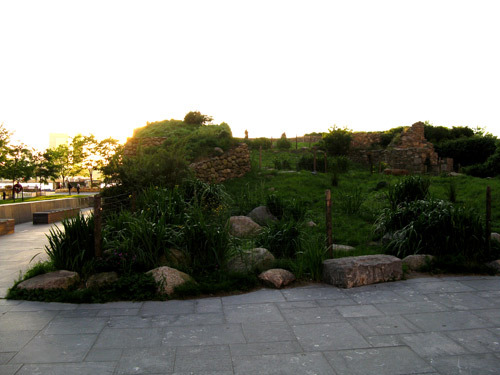 Most strikingly, the memorial incorporates an actual ruined Famine-era stone cottage, donated by distant relatives of the artist, dismantled in County Mayo, and reassembled in downtown New York, minus its modern tin roof. Ironically, the transplanted ancient materials actually withstood their first New York winter far better than the modern materials used to bind them. 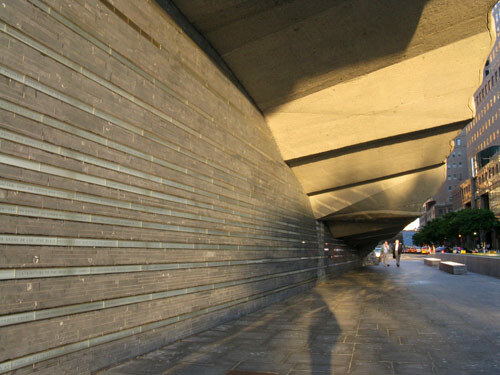 After being open for less than a year, the memorial had to be closed for several months in 2003 for emergency repairs. From the Olympic Sculpture Park, we found our way to Seattle Center by following Broad Street up the hill toward the skyline-dominating Space Needle. 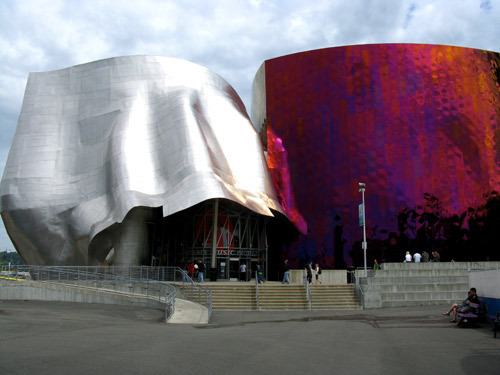 The 74-acre Seattle Center complex was built for The Century 21 Exposition of the 1962 World’s Fair, and serves as the cultural heart of the city: home to the Seattle Opera and the Pacific Northwest Ballet, i.e., the newly transformed Marion Oliver McCaw Hall, numerous theater companies, the Pacific Science Center, The Children’s Museum, and the Experience Music Project|Science Fiction Museum and Hall of Fame. The centerpiece, of course, is the 605-foot Space Needle. 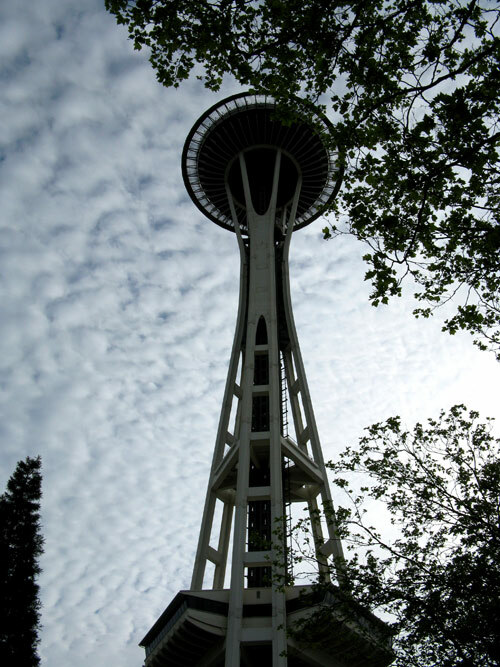 On a rare, clear day — today was not one, alas — the observation deck offers panoramic views of the city, its surrounding mountains and Puget Sound from 520 feet above ground. 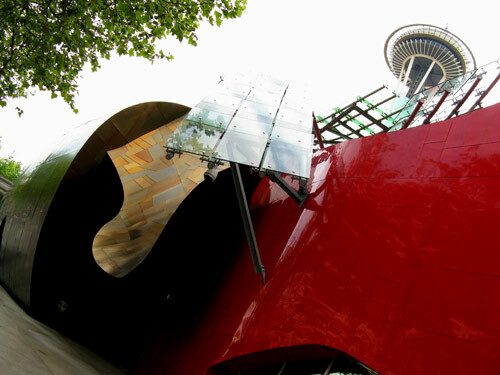 We toured through the permanent exhibitions, which included the excellent “Sound and Vision: Artists Tell Their Stories” — EMP|SFM’s collection of videotaped oral history interviews. I could have spent a couple of hours in that room of monitors and headsets alone, but at least I got to watch the clip of Nichelle Nichols telling the terrific anecdote of television’s first interracial kiss, which occured on the “Plato’s Stepchildren” episode of Star Trek TOS. Not that I’d know anything about that… nope. 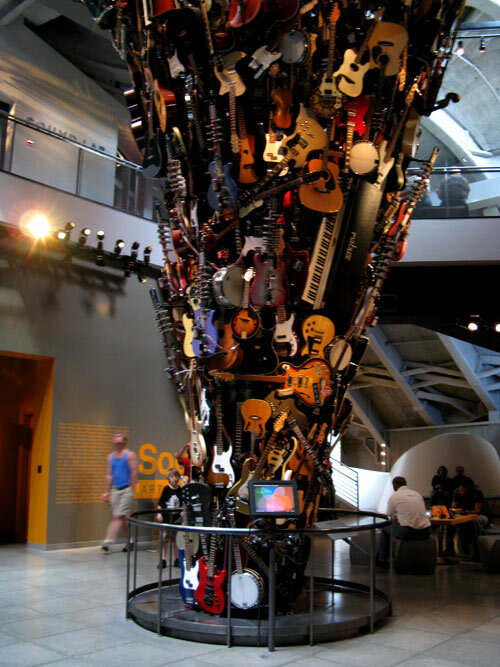 The interactive stations offered the chance to simulate keyboard, drum or guitar riffs, or to tool around with amplifier effects at the “Jimi Hendrix: An Evolution of Sound” exhibit. (Reminded me a bit of Rock Band… and we know how I feel about that.) The “Northwest Passage” traced the development of the Northwest music scene, which apparently owes a lot — much more than I ever would have guessed — to The Presidents of the United States of America. (Them again?) The original handwritten lyrics to “Lump” are enshrined here. Oh, and some band named Nirvana had a few hits, too. On display: Kurt Cobain’s Lake Placid blue Fender Mustang from the “Smells Like Teen Spirit” video — pretty cool. 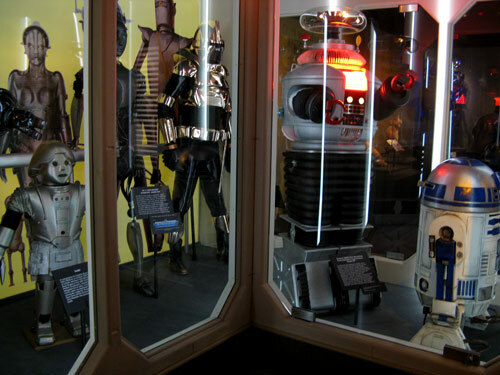 The SFM wing of the EMP|SFM was a cool, if random collection of science fiction memorabilia — robot toys, Star Wars action figures, a T-800 from Terminator 2: Judgment Day, the original model for the Death Star and a few other familiar characters. 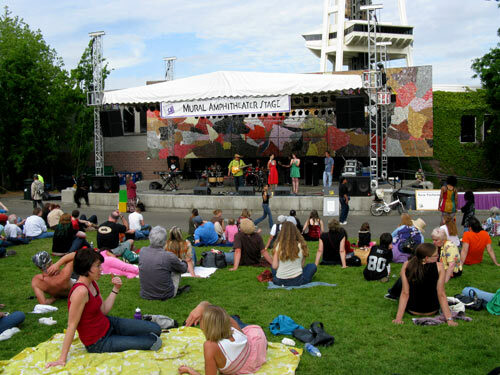 Outside the museum, the annual Northwest Folklife Festival was taking place. Impromptu performances, the waft of incense, stalls selling hemp goods and holistic medicines… if I had been asked to guess at which of the two area festivals there would be a shoot-out this weekend, this would not have been my choice. And live music… because we just can’t get enough. From the stage-facing beer garden, we sipped on cold beer and wine (organic, of course) as Little Big Man commanded the stage with his reggae sounds, wiling away the final hour before I hopped the Monorail (…Monorail …Monorail!) back downtown for the airport shuttle home. Not that’s a full six hours. Once more: full Seattle flickr set.